cryptonaut-in-exile: My "Huh, I did not know that," of the day: Picasso was arrested and questioned during Mona Lisa theft investigation. My "Huh, I did not know that," of the day: Picasso was arrested and questioned during Mona Lisa theft investigation. The theft shook France: the country's borders were closed, administrators at the museum were dismissed, enemies of traditional art were suspected of evil intentions. (The avant-garde poet Guillaume Apollinaire was arrested as a suspect; he implicated Pablo Picasso. Both were eventually dropped as possible culprits). As the months went by, the fears grew that the Mona Lisa had been destroyed. Then the Louvre received word from the Uffizi Gallery in Florence. 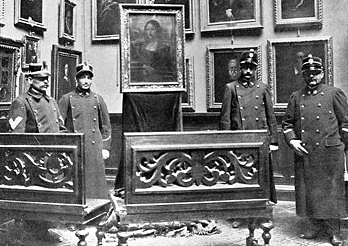 The Italian officials said they had arrested a man named Vincenzo Perugia, who had brought the Mona Lisa to a local antiques dealer in order to sell it and restore it to Italy. (Perugia, who had single-handedly stolen the masterpiece, may or may not have been part of a plot to inflate the prices of forged Mona Lisas; he had lost contact with his co-conspirators and decided to sell the original wood panel painting himself.) 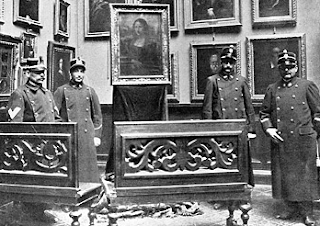 On Jan. 4, 1914, the painting was returned to the Louvre.